I just got home from an inspiring three week trip to the Olympics and capped it off with a private meeting in NYC with some great online marketers at Inc Magazine HQ that Stu McLaren from Wishlist hosted. 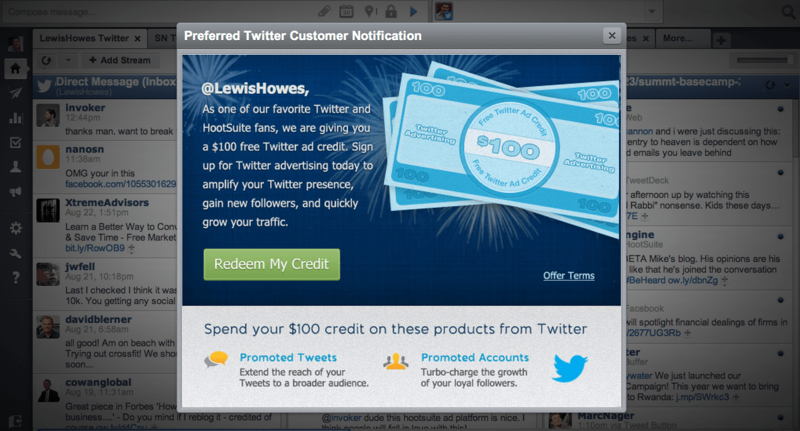 The social media inspiration keept on coming as the first thing I saw in my inbox was an email from HootSuite saying I received $100 free credit from them for Twitter advertising. I’ll be honest. I’m a big fan of HootSuite and the work Ryan Holmes does there and I’ve been using them since shortly after they launched. To see that Twitter and HootSuite look like they are teaming up to increase the usage of Twitter Advertising is very interesting. HootSuite is one of the main sites I use on a daily basis and I almost never go directly to Twitter.com just because HootSuite is easier to manage multiple social networks and connect with all of my social accounts in one place. I asked a few other HootSuite users if they received their advertising credits and they hadn’t receive it yet so I’m assuming they are rolling this out to limited users for testing right now. 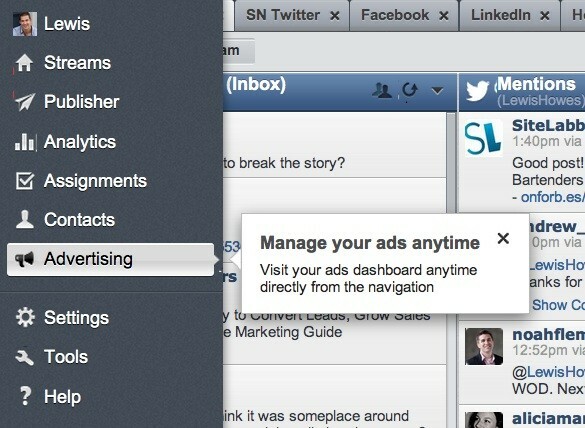 First, check for the Preferred Twitter Customer Notification that should pop up when you login to HootSuite. Then, feel free to watch the welcome video and info about advertising on Twitter for small businesses. For me, I’ve been using Facebook and LinkedIn ads primarily to get more leads for our social media training courses, but I’ve yet to tap into Twitter so this should be an interesting test to see how much traffic this will drive. It took about 60 seconds to walk through their simple sign up process to claim the free $100 worth of Twitter advertising credits. There is now an advertising tab in the HootSuite dashboard which makes it very easy to edit and check your stats once you are all set up. Here’s a shot from the navigation screen on your dashboard. Right now, this looks like it is just a test but this could be a sign that a deeper partnership around Twitter Advertising Products is in the works.I’ll be testing this for awhile to see how much it helps my companies grow and I’ll be using it all from within HootSuite.What are your thoughts? Do you currently use Facebook ads to get more “likes” and leads for your business? Can you see yourself using Twitter ads to get more followers and promote specific tweets? Let me know in the comments section below. Today’s guest at MikeShakin.com is Dave Olson, Community Director of HootSuite Media, Inc. Hootsuite is my favorite Twitter tool. I appreciate that Dave took time to answer my questions. I also appreciate help of Mike Abasov, Marketing Ambassador, HootSuite Media Inc., to organize this interview. Thanks for talking with us, Dave. Let’s start with what Hootsuite is. In a world of Twitter clients, what does the new and improved Hootsuite offer that is different or better than any of the competing tools available? HootSuite is designed for social media managers and agencies who need to manage multiple accounts collaboratively with teams. We also aim to make a tool which allows you to manage all aspects of a social media powered campaign in one dashboard. This means you can broadcast messages across networks, monitor conversations with searches, understand audience behaviour, analyze click stats and much more – all from one tool. In other words, it’s specifically designed for professionals using social media to power outreach efforts. How long did it take to get Hootsuite from brainstorming to final product? What was the hardest part of work? The product is never “final” per se, and it was only a few months from idea to first version. We iterate rapidly with new versions almost monthly and frequent releases of apps and platforms. How did your team go about determining what new features were needed for the next version of Hootsuite? When deciding and the new features for future updates, we look at feedback ideas submitted by users at feedback.hootsuite.com, as well as usage patterns by existing users. We also spend a lot of time talking to agencies and businesses using HootSuite to hear what they want next but always keep focused on adding features which make sense for campaigns success. One thing that drew me to Hootsuite was it’s clean interface and intuitive usability. Can you share a bit about your design, usability, and testing process for the next version of Hootsuite? Our creative director takes the lead on the layout and design and tries to “make it make sense” to everyone. We extensively test and experiment in-house – acting as our own focus group -and adjust rapidly when needed whether to fix layout browser bugs or rearrange things which people are having a hard time finding. For example: Moving all the menus under the “Owl” button in HootSuite 5 was a big change which confused some customers at first, but in the end, this choice was powerful as it made customer support easier, the interface cleaner and gave another compelling brand impression. What do you think of the current market for Twitter applications? As more and more companies start to realize the power of Twitter and other social networks for marketing, they need the right tools to manage them. And while official Twitter web is changing and becoming more complex, it doesn’t target this kind of audience. Additionally with programs like Promoted Tweets and Trends, Twitter is working with 3rd party tools to provide a revenue share and closer technical cooperation. There are certainly many choices for Twitter tools, but we think it’s important to think beyond Twitter and consider other networks where desirable audiences hang out – this includes building for established networks (i.e. Facebook, Linkedin), adding regional specific networks (i.e. Mixi in Japan), and different platforms (HootSuite is now free on 5 mobile platforms). Dave, thank you so much for giving us an insight into Hootsuite! Hazy with a sore throat, Uncle Weed documents journies to the legendary Salt Lick bar-b-q for a slice of rural Texas, plus breakfast oysters, trip to riverside green belt, and rocking out to Black Joe Lewis and the Honey Bears at the Twitter party at The Parish. Plus riffs about drought, reasons for free beer, Big Muff guitar pedals, and forgetfulness, and plans a scant agenda of conferencing and recording.